With email or text, keep you've always wanted. We send you an email or text (or both) everyday at a time you choose. You reply about your day in the way you like: long-form writing, a list, a single sentence, or even photos. Daily Minded collects your posts into a private, beautiful, and searchable online journal. 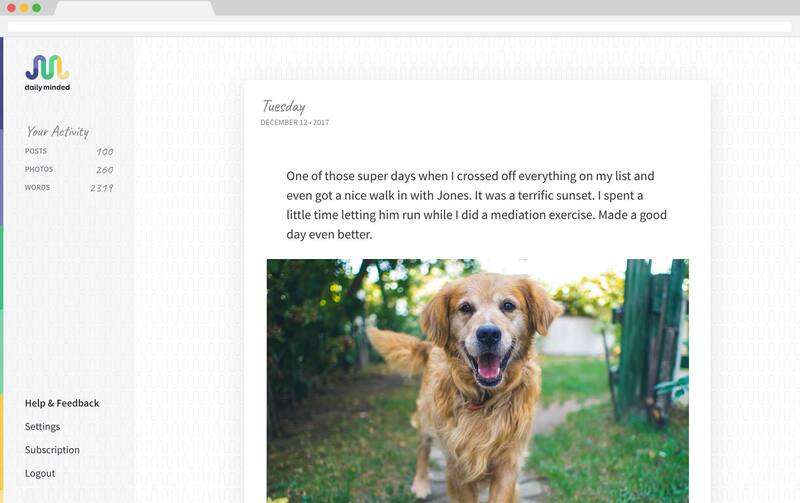 Say goodbye to half-filled notebooks and forgotten-about journaling software. Daily Minded is what you use everyday, email and text. Time is a gift. Be present. It's so easy to distract ourselves with our gadgets. But technology should be a tool not a shackle. Journaling everyday is proven to help us pause, think and consider. Journaling helps you take stock, see connections, and learn from your choices. And it's a joy to read your posts in our beautiful and secure interface. Daily Minded encrypts for privacy. No one can read your posts but you. Easily track your path and mediation experiences. Post first thing in the morning when your dreams are fresh. With texting, add what you're thankful for throughtout the day. Text your experiences (with photos) while having them. With text, add your learning experiences throughout the day. With daily reminders, create the habit of writing everyday. Start your free 14-day Premium trial. No credit card needed.